In DISC mode the target response is sloppy/delayed to the point of being disorienting. If you have any other target to the left or right within a foot it will sound off on the first one but by that time it is over the second one. You swing back to re-acquire the first target, and by the time you are over the first again the report for the second on comes through. Practically unusable. The coil floats so much as to be unusable in water. The TID lights seem great when standing next to it admiring it on a table, then when you try to hunt they immediately become difficult to use. They are along the side and you don't have good enough line-of-sight to make out what they are saying in any daylight. This is important because in order to have decent depth you need to run it in all metal mode. (The TID lights work in all metal.) Even then the depth is bad. Ground balance knob has almost no effect that I could discern. If they fixed the target response and moved TID and the all metal switch to a module on a vertical handle like the ATX it would be fine. Beach Hunter from N. Billerica has it exactly right. Used in that manner, the BH id is very competent and won't waste your time. You might want to adjust the sensitivity down a little until you get the hang of distinguishing noise from signals... Choppy signals are almost always ferrous trash, but if you are like me, it's hard to pass them over. As to the floating coil and the coil flipping up... Just reverse the coil in the water, and you might want to shorten the tube... Then neither of these problems will be problems. The BH id is a very competent, "universal" detector, that has discrimination, and also works in wet sand, and under saltwater quite well. I like to use it in conjunction with a light-weight but rugged scoop that is also a universal-use scoop. This way one outfit can cover any part of the beach whenever you feel like moving from one part to the other. Such a scoop has to be lightweight for the dry and wet sand, but extremely rugged for under the water. I like the Howie Scoop as the ideal match for the BH id. Be careful transporting. The headphone swivels that connect the headband to the cups break easily. No problem putting in new swivels from whites (cheap to free), but I could not pull out the old, broken nub from the ear cup socket, and it fell into the ear cup. It rattles around a little inside there. Not a big deal, but obviously, not what you want. Don't overtighten the screws on the case if you open it up. Better to not wear the unit on your belt in the white's nylon carry case. The battery compartment latch came undone when I did that. I'm making a neoprene case for mine which will secure it much better. Do I recommend it for a new user? Yes...But with caveats, and some of these caveats apply to every water detector. You must realize that it makes some noise in saltwater. You must realize that you will learn quite quickly to distinguish most of the noise from signals. You can reduce the noise by reducing sensitivity and/or threshold...But you may reduce good signals too. Use it in conjunction with a lightweight but rugged scoop, if you prefer wading to snorkeling. Realize it takes more effort to recover items in the water. You will get better at handling the detector and your scoop over time. Some folks use diving weights to help them hold position and dig (scoop). Also, know that you will find gold if you persist. I see some new users complaining about the machine responding on lead, pull-tabs, aluminum, and foil. Well, ALL THOSE metals are in the SAME range as GOLD and nickels! If you discriminate them out you'll MISS the GOLD! This always makes me laugh when I read this. If you're going to hunt beaches and water you want to also detect lead sinkers and pull-tabs. I would not buy this detector again if I had the choice. The floating coil is a pain in the behind! I bought an aftermarket bracket to hold it down and zip tied it to hold it in place. I'm not happy with Whites not taking responsibility for this flaw. I sent it in with a floating coil for a repair and they sent it back to me with a floating coil (shame on you Whites). The case cracked which can happen if you put a hot detector from your car into the water. So make sure to inspect your unit before entering the water and don't leave a detector in the heat(my bad. . . . I'm guessing this is what happened?). The electronics inside are coated with some type of spray to prevent water damage to the board (which works well. . but not in all cases). Not realizing the case had water in it, I turned it on. . . . it started making strange noises (so don't freak out if this happens the electronics are more than likely fine, if the case breaks 35 dollars for top and bottom to replace). Just let it dry out and find the leak,repair it or send it in. Once the electronic dry it will be OK. Make sure to replace the black seal to the orange seal (4. 95 whites store online). 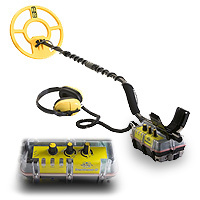 Other than the issue with the coil floating and seal/heat fracture (I experienced) it is a great detector. I found about 8-9 gold rings and countless silver and relics with it. You will dig pull tabs! That is just part of the deal. I was thinking of going the beach hunter id route. Reading reviews kind of made me think twice, I have a 12 inch coil surfmaster, yes its a dig all but works in salt water just as good as dry sand, its outstanding!!!!! I also use an x terra 705, while great in the wet sand, it does the normal jumping around in the salt water, just have to go slow, the surfmaster, your discrimination is listen to your targets and listen well!! It will save on digging up trash! I know tendonitis in your elbow can wreck your day. I bought a Whites Beach Hunter ID new in July 2006, it was repaired twice in 2007 by Whites for leaking gaskets.....Turned out black gasket had design flaw, but I still had to pay the shipping twice for repairs. Whites switch to a orange gasket that does not leak, if you buy a used BH ID, be sure it has the orange gasket, not the black gasket. The coil flots, it is an irritation, can't be call a flaw, but it just makes no sense why a detector built for underwater would have a coil that floats. The LEDs are suppose to tell you good or bad target, but LEDs will report pull tabs, pieces of aluminum foil and bottle caps as good targets so you will still dig all. I also found small pieces of iron, that LED did not always report as iron. I have followed other hunters on the wet sand and found targets behind them, but that can be said of all detectors as some hunters swing in a 180 degree arc and speed walk the beach..
Over all in the wet sand, dry sand, and regular ground it is a good detector, but I can not recommend it in the water, there are better detectors for that. This is a nice detector for coins when that green light goes on high pitch its a coin magnet if you have a aluminum can buried down about ten inches gives great coin tone to but most of the time its on the money. Iron discrimination works great red light, now yellow thats same old story could be pull tab, bottle cap, foil thats a dig all game my 3 tips for this detector here in Florida. First and most important run sensitivity as high as you can and still be able to recognize a steady signal yes its a little bit noisy but you'll get way more finds second tip trust the machine if its chattering multiple lights red, yellow green so on most likely bottle top, toy ect but I have had yellow green mix that was ring, all in all great machine family user friendly. but I stress keep sensitivity high as you can with out it jumping of wall try a bench test with sens. on p setting run ring by it see how far you can get away from loop, then boost sens. to little less then 7/8 max thats were I like it, you will notice difference of inches. third tip if you get multiple color and tone alert signals going crazy stop you must make sure its not multiple items take your time try to separate each signal if you can because you have a big loop many items can be under there at one time try to pick them apart separate them, its worth the time. I hit an area it went nuts green red yellow red but how you tell the difference is if you take time seperate them with center loop you will get a steady signal green green green then your in the money. This machine is well worth the money, well good luck lucky. If your a dig all hunter this machine is fine, on 58 good signals with lights and tone I dug up 6 coins, rest pieces of foil, pull tabs, tin, lead, junk. Machine is very sensitive, ground balance works well, but expect to dig more then your share of junk. Have had great result hunting parks, soccer fields, baseball diamonds and generally out of water areas. It pinpoints well, and is well balanced. The water is where the problem starts. I have a hard time pinpointing the targets. I found that if the target is laying in the open under water no problem but if its buried problem starts. I bought this unit in the spring and used it extetively out of water and very happy with the results. Maybe more time in the water will change my outlook. The coil in the water is also a concern. I've partly solved this problem by adding a PVC tube closed at both ends filled with sand attached to the lower shaft close to the coil with plastic twist ties (no metal) contact. Also bought a bracket to keep the coil from moving up or down. Other wise I think its a great detector,just hoping to master it in the water. Good on land but frustrating to use in water. I've had it for about two months and bought it to use in shallow water but it is completely useless. The coil floats and since it is one solid piece it gets kicked around by the current and is almost impossible to use in the water. Why they sold these as water machines is beyond me. At best they are a good land machine that can get wet.